Just took a vacation to Las Vegas. Sweet. We went there to hike. What? Yep! 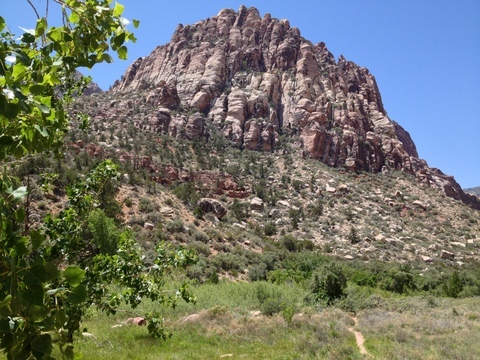 One of my favorite things to do is Red Rock Canyon hikes while I’m in Las Vegas. What a beautiful area! Who said that the desert is boring? It was absolutely beautiful, sun shining, clear blue skies, light breeze and hardly anyone else there. This is a maximum 40 minute drive West of downtown Las Vegas. There is a fee to go in to the Visitor Center and drive the scenic loop. But it’s really worthwhile. The Red Rock Canyon hikes are all beautiful and if you’ve never seen Las Vegas from the outside, make sure and do this next time you go. On this particular hike along Pine Creek Canyon, you come upon the foundation for a long gone house. Someone had real vision to build a house there. Sitting above a fairly year round creek with cottonwood trees for shade, the views are spectacular. Not only that, but all along this valley the wild horses and burros travel through and would have provided a lovely sight for the owner of the home. There are many Red Rock Canyon hikes. One is called the Icebox trail because it’s always cooler as it meanders between two very tall rock spires which shield you from the sun. And there are amazing views of downtown Las Vegas on some of the other hikes as well. A fascinating area with rock that is really very red. In fact, when you go to the Vistors Center, the view out the window is simply stunning. Even in a year when we have have very little water in the Western States, this area still have plenty of color and plenty to enjoy. There is so much more to do in Las Vegas than gambling and shows. We hiked around Mt Charleston and also at the Valley of the Fire. These areas are also within an hour of the downtown. And if you are planning on doing a buffet in Vegas, meaning, eat a whole lot of food at once that your body just does not need, at least spend one day to work some of it off. You won’t be sorry! 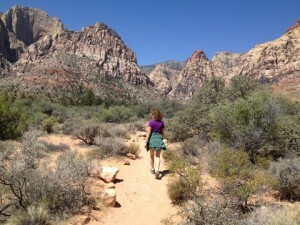 This entry was posted in Fun Stuff to Do, Horses and Donkeys, Real Estate News and tagged Red Rock Canyon Hikes. Bookmark the permalink.